I keep getting an error message when trying to open threads, I've cleared the cookies, changed the time span to all topics but still cant open them. Up till now I've just ignored it but cant open my build thread now. Also the time span keeps going back to seven days, is there a way to change it? I will get Jason to have a look at this post when he gets back in. Am a little confused with the screen shot you have posted. 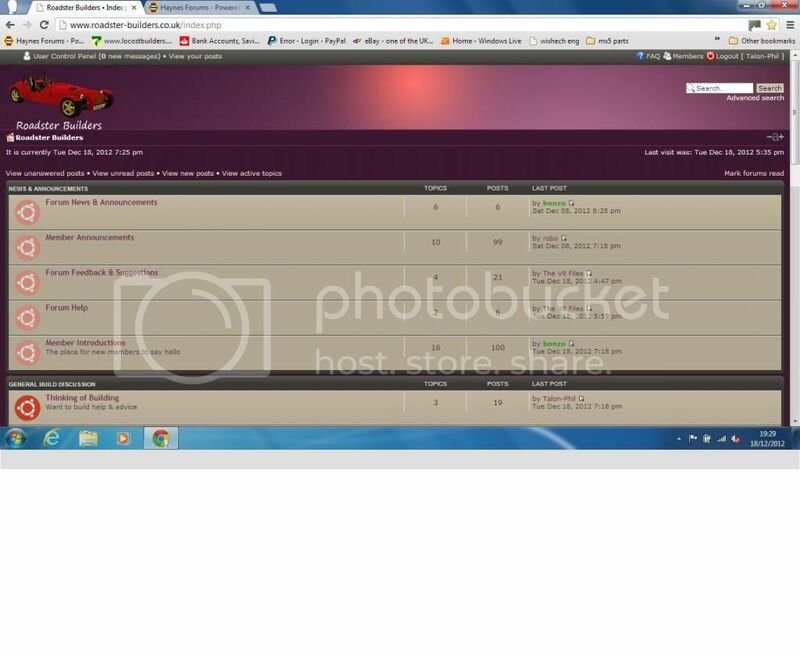 That is the original old forum skin ( Board layout ) , looks nothing like that now. Wish I knew how to take a screen shot & post it up. Perhaps there are some ghost files of the original forum tucked away in the HTML code. !! How comes your screen looks like that and my screen looks like this? Edit: must have been posting at the same time as Ronnie. Didn't have a clue how to do that. You can choose different skin in 'User Control Panel', 'Board Prefernces' then there's 3 options, just tried the other 2 but unfortunately still the same. Will get Jason to have a look into it when he gets in. Didn't realize there were options to change the forum skin. Not sure if that was Jason's intention or if they are orphan files that still work ! Will get Jason to have a look at the boards global settings. I don't tend to go into the boards Admin control panel as I don't fully understand all of that side of things & could screw things up big time if not careful . I did ask Jason about the different board skins, he said that he meant to disable the 2 old skins. Asked him to hold off on that for the time being as some folk may prefer to view the forum using a different skin.